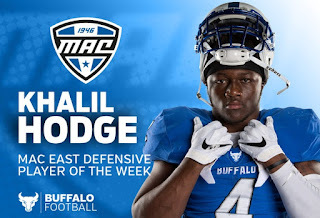 BUFFALO, N.Y. -- For the second straight week, University at Buffalo linebacker Khalil Hodge was named the Mid-American Conference Defensive Player of the Week, the conference announced on Monday. It marks the fifth straight week the MAC has honored a UB player. Hodge tied a career high with 20 tackles against Army on Saturday. It was the second time in his career he totaled 20 stops. The senior linebacker was making plays all over the field, finishing with three solos tackles and assisting on 17 others. Hodge ranks third in the nation in tackles with 67. He has moved into sixth place in school history in career tackles with 344. He has done so in only 29 games. It is the fourth time Hodge has earned Player of the Week honors in his career. It is the fifth straight week a UB player has won MAC Player of the Week honors. Quarterback Tyree Jackson won offensive player of the week honors each of the first two weeks. Cornerback Cameron Lewis was named defensive player of the week after his two-interception performance against Temple. Wide Receiver K.J. Osborn was honored after his 188-yard, three-touchdown performance against Eastern Michigan. 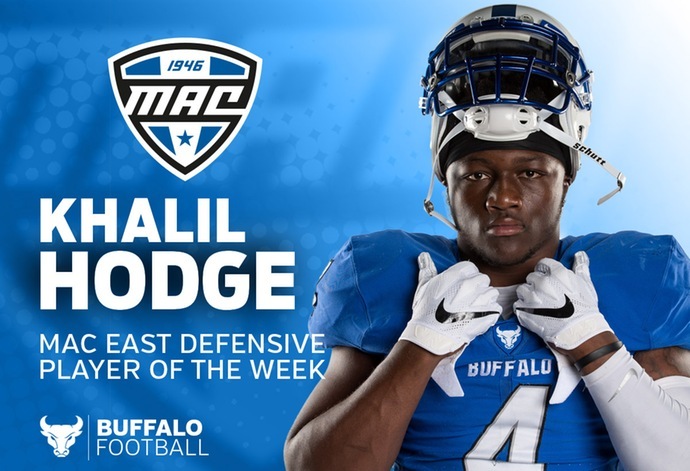 Hodge also won the award following his 15-tackle performance in UB's win at Rutgers. The Bulls will look to improve to 2-0 in MAC play on Saturday at Central Michigan.